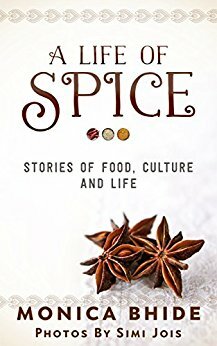 In A Life of Spice celebrated writer Monica Bhide explores her romance with food. As in any romance, there are moments of great heartache and unbelievable happiness; betrayals and breakups; and, of course, intimacy. This collection of powerful and thought-provoking vignettes makes us examine our relationship with food deeply – and what food really means to us. Monica writes stories about food, but often they are really stories about searching. She looks for what the world will reveal if you ask questions of the things we usually keep silent. She’s a generous writer, seeking the finer, richer sides of us. Monica Bhide is more than a food writer. She’s a chronicler of culture and family history. She is a romantic for the bond between parent and child. She is an essayist of her own heart and mind, fearlessly searching for the truth in both. She is endlessly fascinating to read. Monica Bhide’s unbridled devotion to food, words, family, and history is crystal clear in this delicious collection. Whatever Monica’s subject — her father as a young boy, the connection between her family and their mouthwatering food, or the importance of saving recipes — she writes with warmth, a keen eye, and an open and abundant heart.